Relax. We’re dedicated to being your roadside assistance company of choice. With the use of highly trained professionals, proper towing equipment, and responsive dispatch; our mission is to make your inconvenient situation better by consistently providing safe, timely and economical roadside towing services. 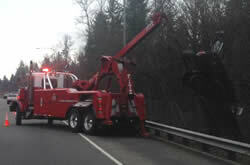 You can rest assured that our tow truck drivers are experienced, safe and courteous. They strive to arrive within 30 minutes to help with your roadside assistance, recovery, lockout and towing service needs. Locked your car keys inside the car? No problem, contact Fitz Towing for emergency auto lockout service in Auburn and surrounding communities. Our highly trained personnel will open your car door “damage free” so you can get back to your daily routine in no time. Do you have a dead battery? Were your car lights left on? Relax! 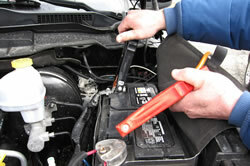 Contact Fitz Towing Auburn for emergency auto jump start service. We will get you back on the road in minutes. Oh no. Flat tires are no fun. 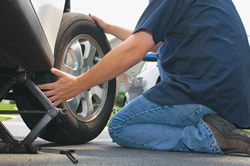 Rely on our speedy 24/7 emergency tire change service in the Auburn area. As long as you can provide us with a spare tire, we can change your flat tire. Don’t let a flat tire ruin your day, let Fitz Towing come to your rescue with prompt spare tire service. Are you out of gas on the side of the road? Fitz Towing can help now. 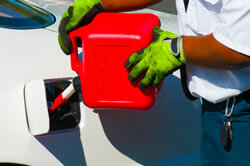 We will bring you the fuel you need to get you to the nearest gas station in and around Auburn. Whether your vehicle uses gas or diesel, we can usually make a fuel delivery in 30 minutes or less. Are you in a really big jam? Can’t get your car out of a ditch, snow, mud, water or sand? A winch out may be the solution for you. Fitz Towing in the greater Auburn area has the necessary tow trucks, wreckers, and winches to get you out of really tight spots.